65.6 million: this is the number of refugees in the world (source UNHCR in 2016). This is almost the equivalent of a country like France (67.19 million). 26,000 is the number of people packed in the Container City Camp in 2017, near the small town of Kilis in southern Turkey, on the Turkish-Syrian border. These numbers are impressive. Since 2014, in partnership with the Turkish Judo Federation and local authorities, the International Judo Federation has developed a Judo for Peace programme aimed at restoring the smile of hundreds of children who have had to flee the war in their country, and who ended, often traumatized, with what remains of their family, in the Container City camp. 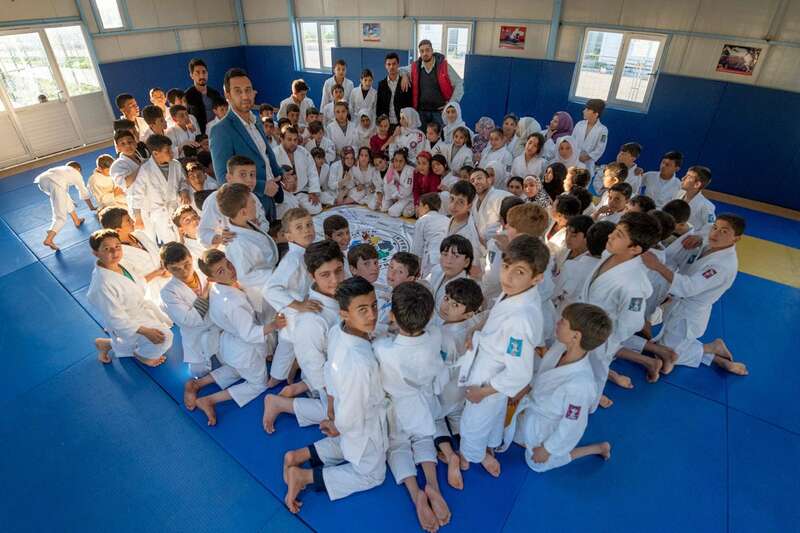 At the recent Antalya Grand Prix (April 5-7), 20 of these children were invited to discover a World Judo Tour event (https://www.ijf.org/news/show/eyes-full-of-stars). 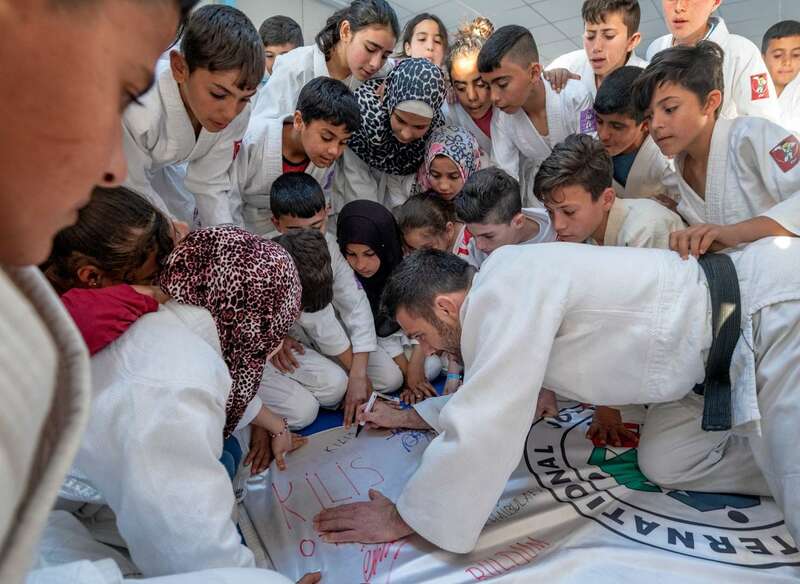 In the wake of this great adventure, the Judo for Peace Commission, led by its director, Nicolas Messner, and Olympic Champion Pino Maddaloni (ITA - Sydney 2000) went to Kilis to evaluate the programme and to share with young refugees some precious moments on the tatami. "Within a few years, the programme has been growing continuously. It all began with a few dozen children in 2014. Today there are more than 2,000 young people who have discovered judo and learn the basics of the sport both from a technical and mental point of view. There are currently 350 regular judokas", explained Nicolas Messner, who was on the spot for the fourth time, before adding:" What is particularly striking this year is the number of young girls who have started practicing judo. At first, there were only boys. But in 2019, there are a lot of girls and obviously they have a lot of fun and enjoy being on the tatami." For four days, meetings, conferences and judo sessions were chained in the city club that hosts Turkish children and refugees, and in the Container City where a permanent dojo was built for the greatest happiness of all. The least we can say is that the craze for judo is just as visible as the smiles that appeared on the youthful faces of the participants: "I had a lot of fun sharing these moments with young judoka. Their smiles gave me incredible energy. I'm going back to my club in Naples with a desire to do even more," said Pino Maddaloni. It must be underlined that the man had something to share. Born in the neighborhood of Scampia (10 July 1976), near Naples (Watch the Judo for the World Scampia: https://youtu.be/94swukZsbd0), one of the most dangerous in Europe, he became Olympic Champion, despite all the difficulties associated with the violence that reigned around him as a child. Today he is also one of the IJF supervisors and brings his expertise to world circuit competitions: "My life is judo. This sport has given me everything and I am happy to give back what I've learned. I like my role as a supervisor and I love being on the tatami with children, especially when they do not have the opportunity to get into life in the best way. Those few days at Kilis were filled with emotions. There is a real passion for judo here and a huge potential for development." Öner Buldum, the Kilis coach, can be proud. In the space of a few years, he has brought hundreds of children back to life, when many of them knew only the throes of war and the fear of escaping: "Working with refugee children is incredible. They tell us a lot about the notion of resilience. They often carry trauma that we do not see at first, but that we learn quickly to detect. Thanks to judo, we manage to give them back the taste of life and we allow them to dream again. The twenty children who went to Antalya for the Grand Prix were delighted. The other 120 who participated in the judo sessions with Pino and Nicolas also had their share of happiness. We all learned a lot from them." Things are not simple and they evolve constantly: "One of the difficulties is related to the volatility of the public. Children come and go and it is sometimes difficult to do long-term work. The situation is calming a bit on the other side of the border, the camps are also emptying little by little, but the refugee crisis is not over yet and we still have years of work ahead of us. We still need human resources to supervise children more qualitatively. We would like them to have more opportunities to go out and we are doing everything possible to create the necessary conditions for the development of friendship between the local population and the refugees", concluded Öner. Remzi Arkalti, the Sports Director of the Kilis Region, believed in the Judo for Peace programme from the very beginning. Since 2014 he has been an unwavering supporter of judo activities: "Judo is a fantastic tool for these young people in difficulty. We have a brand new sports center in which we are building a new dojo which, in the next few months, will accommodate even more people. We work in the sports field, but also in the cultural field. It's very important. We are slowly starting to set up activities on the Syrian side. It's a complex job but one that pays off. I am very happy that the Judo for Peace commission comes regularly to visit us in Kilis and this year I am particularly honored by the visit of Olympic champion Pino." Maddaloni and Messner were also able to share their experience with all of Kilis' sports coaches during a conference held the day before they left. For nearly three hours the two men exchanged with the educators who work daily with more than 11,000 young refugees (all disciplines). The discussion was particularly rich and there are plenty of ideas to do even more. Less than two years ago, bombs still rained down on the region and the influx of refugees was daily. Today, the sun is shining on Kilis and its region. Nevertheless, there is still a lot of work to be done: support and integration work and a work of values ​​transmission. Being a refugee is no longer a fate, there is hope, a lot of hope. Putting on a judogi and playing on the tatami are some of the useful and necessary tools to give a smile to this youth who asks only one thing: embrace life, laugh and dream of better days that can guide them to sunny days, a sun that is not veiled by the smoke of the bombs.